Turkish PM says Israeli air strike on Syria violates international law, ignores his own country's similar past actions. Turkish Prime Minister Recep Tayyip Erdogan accused Israel on Sunday of waging "state terrorism" as he condemned the alleged Israeli air strike on Syria as an unacceptable violation of international law. "Those who have been treating Israel like a spoilt child should expect anything from them, at any time," Erdogan said, according to AFP. "As I say time and again, Israel has a mentality of waging state terrorism. Right now, there is no telling what it might do and where it might do it," he told reporters. "We cannot regard a violation of air space as acceptable. 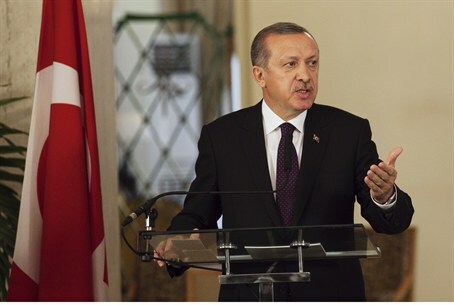 What Israel does is completely against international law... it is beyond condemnation," Erdogan said. "I am worried that in a situation like this, any scenario can play out in the future," he added, noting that Israel was using claims about weapons being moved into Lebanon to justify its action as "an excuse." Just several months ago, the Turkish army attacked several targets in Syria after a mortar shell fired from Syria exploded on Turkish territory and killed five people. The Turkish parliament later authorized cross-border military action into Syria, if deemed necessary by the government. The mandate, valid for one year, was passed by 320 votes in the 550-seat Turkish parliament on October 4. Last Wednesday's air strike, allegedly carried out by Israel, targeted surface-to-air missiles and an adjacent military complex believed to house chemical agents, according to a U.S. official, who spoke on condition of anonymity. Israel has not commented on the attack, and has not officially confirmed its involvement, although Defense Minister Ehud Barak earlier Sunday hinted at the possibility that Israel did carry out the attack. Speaking to top international diplomats and defense officials at a conference Sunday in Germany, Barak referred to the attack as “proof that when we say something, we mean it." Erdogan, who has taken every opportunity to publicly lash out at the Jewish state over the past several years, was not the first Turkish official to take advantage of the alleged attack to criticize Israel. On Saturday, Erdogan’s Foreign Minister Ahmet Davutoglu attacked the Syrian government for failing to respond to the Israeli airstrike, claiming that the Syrian stance raises suspicions that there is a secret deal between the two countries. “Why has the Syrian army, which has been attacking its own people with warplanes and tanks for 22 months, not responded to this Israeli operation?” Davutoglu was quoted as having asked when speaking to a group of journalists en route to Serbia. “Why doesn't [Bashar al-Assad] throw a stone at the Israeli planes while they fly over his palace and insult his nation's honor? Why doesn't he do anything against Israel while he drops bombs on the innocent people of his country? Is there a secret agreement between Israel and Assad?” he added.